We are honored to work with our partner organization, OBAT Helpers, to bring digital learning to displaced children in Dhaka, Bangladesh. Together, we have been able to expand the educational opportunities available for children whose families have lived in a refugee camp for generations. Our digital learning program currently brings Math, English and Bangla to 140+ pre-school and working children. We plan to expand the program to serve 300+ students in 2019. The children begin class every day with a little yoga and meditation. Learning to write numbers is easy when it is part of a game! Day 1 of the pilot project at the Dhaka refugee camp. Preschool children are excited to hold their new tablets. The tablets were handed out without instruction. We observed how quickly the children were able to manipulate technology they had never previously encountered. Without any directions, this little girl has already figured out how to make her tablet work. This young student is learning the Bangla alphabet. 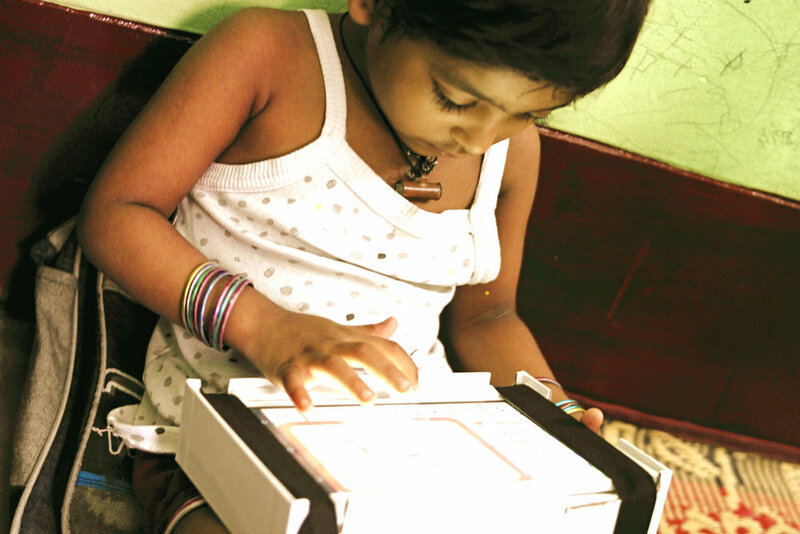 A young girl working with her tablet on a special desk, created by our Teach the World intern, Sunny. The digital classroom in Dhaka did not have desks with chairs, so Sunny designed and built a “tablet table” to help the children work comfortably on the floor. New headphones help the children to concentrate on their own work. Sana is clearly enjoying her learning game! The adaptive-programming means that the children are free to work at their own pace. Since the 1971 civil war between East and West Pakistan that gave rise to the independent nation of Bangladesh, 300,000 stranded Pakistanis have survived as a forgotten population in refugee camps around the country. Even 45 years after the end of the war, these families still live in harsh conditions in slums and makeshift camps. Half are children under the age of 15. Less than 10% of these children have the opportunity to gain an education and move out of poverty. Many of the older children have to work in menial jobs, in order to help their families. OBAT is on the ground at multiple refugee camps in Bangladesh, providing medical clinics, micro-lending programs, schools and job-training opportunities.